I saw an interesting study this week that seems to play in to two different topics I’ve talked about here: self reporting bias and the Dunning-Kruger effect. 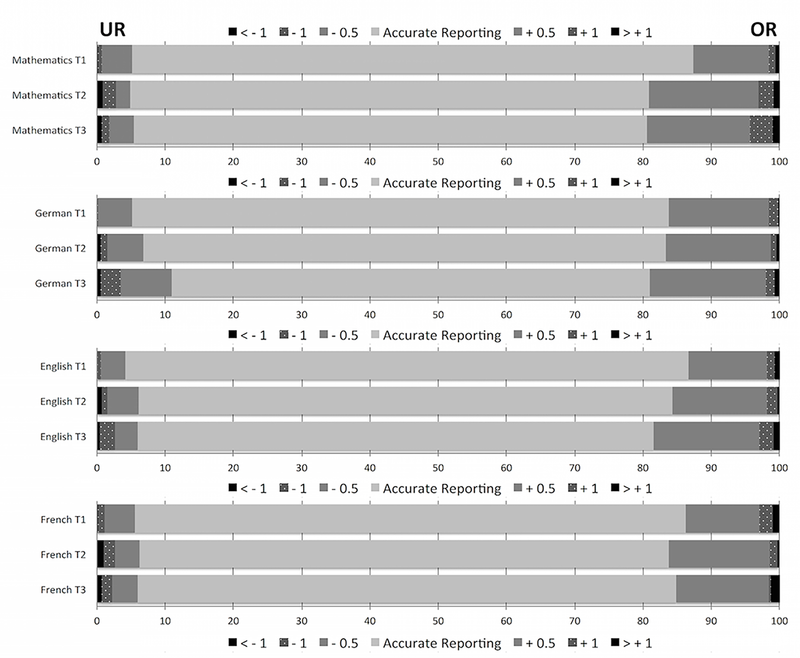 Unsurprisingly, kids were much more likely to over-report than under-report. Since most of the differences were adding a half point or so (out of 6), one wonders if this is just a tendency to round up in our own favor. Interestingly, a huge majority of kids were actually quite honest about their ability….about 70% for most years. The authors also noted that the younger kids were more likely to be honest than the older kids. I think this is a really interesting example of how self-reporting biases can play out. It’s easy to think of bias as something that’s big and overwhelming, but studies like this suggest that most bias is small for any given individual. A rounding error here, and accidental report of your grade from last semester….those are tiny for each person but can add up over a group. I suspect if we looked at those older students who reported their grades as inaccurately high, we would discover that they had gotten high grades in previous years. There does seem to be a bias towards reporting your high water mark rather than your current status….kinda like the jock who continues to claim they can run a 5 minute mile long after they cease to be able to do so. The phenomena is pretty well known, but it’s always interesting to see the hard numbers.